This page displays the current size of the English Wikipedia (without images) in print volumes, per mathematical calculation. This shows 3.65 billion words[not in citation given] across 5.71 million articles (as of September 2018), implying an average of 640 words per article. Same source shows 29.528 GB (=30,236,213,250 bytes) across 3,654 million words, implying 8.08 bytes/word. ASCII uses 1 byte/character which in turn implies 8.08 characters/word. However, this includes wikimarkup, and 5 char/word plus one for space is standard, so 6 characters/word will be assumed. There are currently 5,845,300 articles, which means 3.740992×10^9 words, which means 2.2445952×10^10 characters. Thus, the text of the English Wikipedia is currently equivalent to 2,805.7 volumes of the Encyclopædia Britannica. 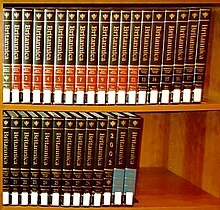 Sanity check: Encyclopædia Britannica has 44 million words across 32 volumes, or 1,375,000 words per volume. This would imply 2,720 volumes for WP. First bullet source only contains wordcount data from 2010 (1.798 million). 3.2 billion found by multiplying 2010 avg word-per-article (580) to current number of articles (5.50 mil). 3.53 bil found when multiplying current article by words-per-article count of 630[where?]. In June 2015, artist Michael Mandiberg (User:Theredproject) generated a 7,473 volume print-ready collection of the English Wikipedia in PDF format, printed wallpaper representing the spines of the books, and printed over 100 volumes through print on demand service Lulu, as part of an art installation at the Denny Gallery in New York City. The table of contents alone took 91 volumes to list the nearly 11.5 million articles. ^ Schuessler, Jennifer (16 June 2015). "Moving Wikipedia From Computer to Many, Many Bookshelves". The New York Times. Retrieved 20 June 2015. ^ "Github site mandiberg/printwikipedia". Retrieved 2015-07-02. "Wikipedia Encyclopedia as a Printed Book". Labno.org. 15 July 2012. "What if? Updating a Printed Wikipedia". xkcd. August 2013. "The Wikipedia Books Project: We'll print the complete English Wikipedia in 1000 books". PediaPress via Indiegogo. 2014. This page was last edited on 11 April 2019, at 12:25 (UTC).